Oil furnaces have been heating homes throughout the USA just as long or longer than any other type of forced air furnace. In some areas of the Country, home heating oil is much more common that natural gas, making oil furnaces more popular than gas furnaces for nothing more than the fuel availability. In this Furnace Price Guide, we’ll be talking about Oil Furnaces that use forced hot air to distribute heat to your home. We’ll provide pricing information for wholesale and dealer installed oil furnace replacement cost, variables that can effect oil furnace prices such as sizing and efficiency, as well information related to the cost of repairs and maintenance of this type of home heating system. Finally, near the bottom of this page we have a section devoted to prices submitted by visitors like yourself, containing the details of your own oil furnace cost, when you last replaced or had a system quoted. Updated January 2019 – To include newest oil furnace pricing, as well as new 2018 – 2019 repair and installation costs. Just like any HVAC product or equipment you purchase, the oil furnace brand name or manufacturer will have an impact on the price you pay to have the unit installed.If you can buy an oil furnace yourself, the brand name will affect the wholesale cost as well. Along with the differences in manufacturing quality, Contractors who choose to align themselves with the highest rated oil furnaces tend to charge more as well. As always, we recommend having a professional install your oil furnace, since a quality installation is just as important as choosing the right brand. To give you estimates of average oil furnace prices from the leading manufacturers below, we like to use the standard home size of 1600-2000 sf. To heat that area, we’ll use an 85k btu furnace equipped with a fixed speed 1200 cfm blower, and we’ll assume the home has a utility closet on the main floor or in the basement. The 275 gallon oil tank would be freestanding, in the yard or basement. Oil furnaces need to be properly sized for your home just like other types of furnaces. 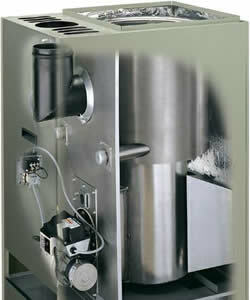 If the wrong size oil furnace is installed it can waste energy and cause you to spend more on home heating oil. Increase the need for service and maintenance, provide inadequate heating for your home and of course, reduce the life expectancy off the furnace. To have a properly sized oil furnace in your home,, you should enlist the services off a local contractor who can perform a heat loss load calculation on your home, or find a Manual J load calculator software online, that can help you with each of the detailed measurements need to do it right. Due to the energy savings of having a properly sized furnace, several states now require load calculations in order to get a permit and inspection. For the purpose of this size and replacement cost comparison, we’ll use a standard (80% afue) to high efficiency (86% afue) oil furnace example, installed in the basement of the home. Oil furnace troubleshooting, diagnosis, service and repair, is best performed by a trained and certified technician, who knows the ins and outs of the unit being worked on. 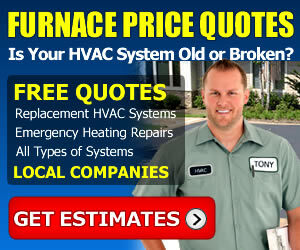 We recommend you always have a professional look at your oil furnace before you ever attempt to repair it on your own. The table of repair cost estimates below, includes service call estimates, troubleshooting, removal and replacement of the parts, as well as the retail cost of the part, if you were to purchase and install it yourself. The installation times shown in the table represent the approximate time it would take for a trained oil furnace repairman to troubleshoot and repair your oil furnace. The final column, “parts installed”, includes all parts and labor, including the service call cost, to have your oil furnace diagnosed and properly repaired by a professional. 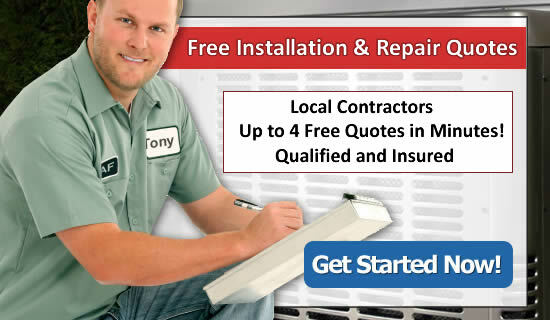 If you want free repair or replacement quotes for your oil furnace, click here and complete the free quote request form. Even though we go to great lengths to be sure our oil furnace prices are kept up to date, we can’t include everything! In this section of the page you’ll find prices submitted by readers just like yourself. If you recently had your oil furnace replaced, repaired, or even had the complete system changed out, please consider sharing the details of your project with others by completing the short form on this page. We never share personally identifying information on our website and future readers will be grateful. This was the first time we’ve had to replace our oil furnace, the old one was 28 years old and just kept breaking down year after year. Our son in law recommended a thermo Pride oil furnace so we had one installed. Works great and we’re warm again. The company said we were one of the few oil furnaces they saw in Charlotte area anymore, everyone has converted to gas or heat pumps. Anyhow, 2 guys replaced it one day. We also had the oil tank pumped out, (only the bottom of the tank, 10-20 gallons) cleaned, and refilled with clean home heating oil. Old heating system was at least 30 years old and looked every bit of it’s age. The oil furnace installed cost included a tank cleaning, plumbing a new feed line to the furnace and disposal of the old oil furnace. Our old pump failed and instead of replacing the pump itself, we decided to go with a higher efficiency oil furnace. We would have switched to gas, except its not in our area, and we didn’t want to deal with a bottle. Dealer removed old oil furnace and replaced with a new Carrier system. Also replaced several sections off older duct in the basement while they had it opened up.